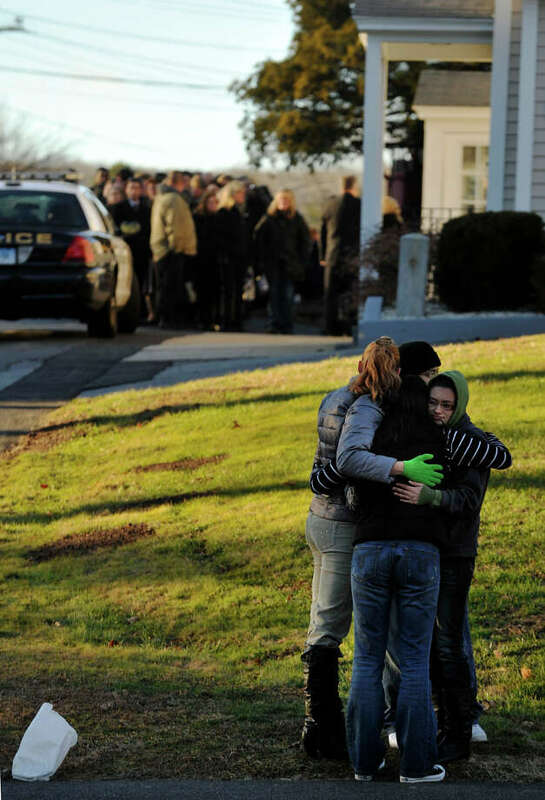 People embrace outside funeral of Sandy Hook principal Dawn Lafferty Hochsprung at the Munson Lovetere funeral home in Woodbury on Wednesday, Dec. 19, 2012. WOODBURY -- As hundreds of mourners for slain Sandy Hook Elementary School principal Dawn Hochsprung arrived for calling hours Wednesday, luminaries were on display, designed to spell a single word: Hope. Hochsprung died at the school in an effort to stop 20-year-old Adam Lanza from embarking on his shooting spree Friday that claimed the lives of 20 students and six adults. She has been hailed as a selfless educator whose dedication to her young charges is an inspiration to people around the world. "I'm not even a little surprised that Dawn died a hero. Nobody was going to hurt one of her kids," said Kim Gallo, a lifelong friend and former colleague from Hochsprung's years as an educator in Woodbury.
" I knew Dawn for 22 years," said Brian Jones, of Southbury, a family friend. "Dawn set positive goals and met them. She had a positive, outgoing, energetic spirit. People loved to be around her. She's a shining example of all that's good and positive in the world." Coast Guard cadet Alexis Kanapp, 18, brought a handmade card from the seventh-graders of Woodbury. She'd known Hochsprung as her principal. Gov. Dannel P. Malloy arrived to pay his respects and left shortly after 3 p.m. Newtown First Selectman Pat Llodra, Danbury Mayor Mark Boughton and former Danbury Mayor Gene Eriquez were among those attending.